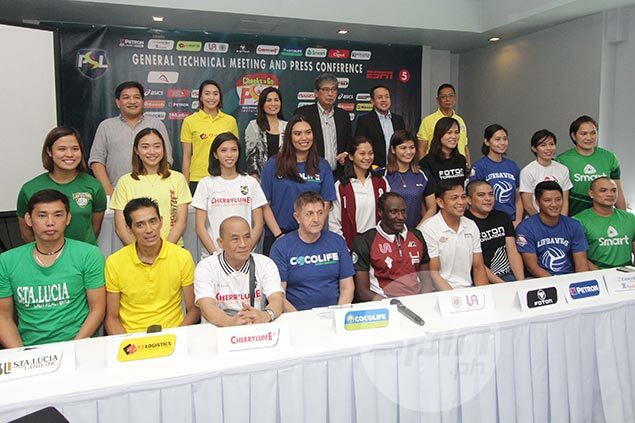 THE Philippine Super Liga has allowed the Philippine team to play its eight regular teams but not the two guest schools due to the short duration of the PSL Invitational Conference. The Larong Volleyball sa Pilipinas, Inc. (LVPI) has asked the PSL if the Asian Games-bound national team could see action in the three-week Invitational Conference, which starts on Saturday at the Araneta Coliseum. But the national team will only face the eight club teams, namely Cignal (June 28), Sta. Lucia (June 30), F2 Logistics (July 7), Cocolife (July 10), Petron (July 12), Foton (July 14), Generika-Ayala (July 24) and Smart (July 26). Not included in the national team's schedule were games against University of the Philippines and University of the East. “The board decided to insert the national team dito sa PSL to make sure that the team will have continuous training,” said Ariel Paredes, PSL representative to the LVPI. “Regrettably, we cannot accommodate all the 10 teams dahil the Invitational is a very short format and we are dealing with time issues for the national team and the rest of the teams to prepare for the Asian Games,” he added. Aby Maraño, Jaja Santiago, Dindin Santiago-Manabat, Ces Molina, Mika Reyes, Kim Fajardo, Kim Dy, Cha Cruz-Behag, Majoy Baron, Dawn Macandili, Rhea Dimaculangan, Denden Lazaro, Mylene Paat, CJ Rosario, Maika Ortiz, Myla Pablo, Rebecca Rivera and MJ Phillips will suit up for the national team in the PSL. In games pitting the Philippine team with their mother squads, the national players will be suiting up for the latter. Alyssa Valdez and Jia Morado, stars of PSL rival Premier Volleyball League, won't be taking part in the PSL games.